Discovering that Jaguar numbers are increasing on the Programme for Belize lands was the highlight of a speech given by Edilberto Romero, Executive Director of Programme for Belize (PfB), whilst visiting the UK last week. At a small gathering of long-term supporters of PfB, Mr Romero gave encouraging facts and figures demonstrating that Jaguar numbers really are on the up, in PfB's protected forests. Mr. Romero visited the UK to spread the news about PfB's critical conservation work in the heart of Central America. His visit was hosted by the World Land Trust (WLT), which has helped purchase and protect over quarter-of-a-million acres of tropical forest in Belize, now known as the Rio Bravo Conservation and Management Area (RBCMA). The WLT was honoured to welcome Mr. Romero on his first visit to the UK, and organised a series of meetings and activities focusing on conservation and sustainable development. Whilst in the UK he met with representatives of WWF, RSPB and DFID, in order to develop partnerships that will help PfB in their future conservation efforts at the Rio Bravo. PfB is a non-profit organisation, launched in 1989 with the help of Massachusetts Audubon Society and the WLT, which owns and manages the RBCMA, a 260,000-acre reserve in Northern Belize. RBCMA is home to a wide array of wildlife, including 12 endangered animal species. This reserve forms a significant part of “La Selva Maya”, continuing into Guatemala and Mexico, and is the largest area of continuous forest in Central America. Supported by Sir David Attenborough (a Patron) and Dr David Bellamy (former Trustee), the WLT was set up to raise funds for PfB in 1989. Since then WLT has gone on to set up similar projects in Ecuador, Patagonia, Costa Rica, the Philippines and India. 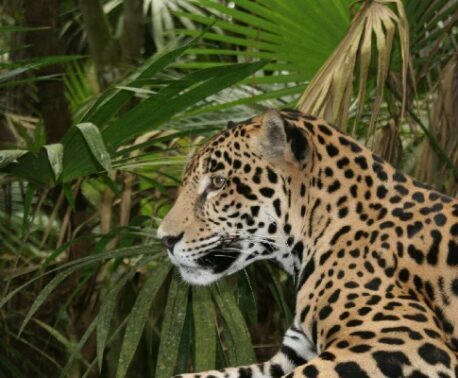 The World Land Trust still needs your help to support conservation work in Belize, and to ensure the ongoing survival of the Jaguar, as well as the hundreds of other species that depend on the tropical forests for their survival. Please make a donation now! For more information, contact WLT. Read more about our project in Belize.